There were, I regret to inform, no highlights from this evening. Their often raved about pickle soup did taste like pickles, however it was overly salty and watery for our palettes, and we were glad we’d opted for the cup size instead of a whole bowl. Their wild mushroom and sauerkraut perogi were extremely light on the mushroom, and consisted mostly of sauerkraut, which for fermented cabbage still managed to somehow be bland. 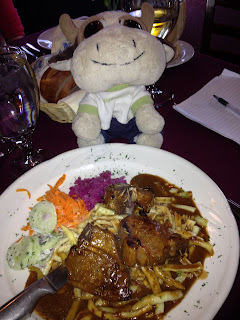 The lamb chop we ordered medium rare ended up being cooked medium, while the accompanying spaetzle was bland and chewy. The pork cutlet was bland, and the fish, surprise! Was bland, and overcooked. The polish cutlet was, surprise, bland and drowned in a ton of dill sauce that was not surprisingly flavorless. 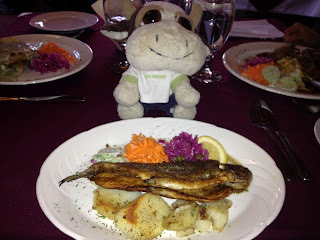 The rainbow trout was probably the most decent dish of the night as it tasted as though it was at least seasoned. We didn’t bother trying out their dessert and instead opted to head elsewhere to avoid further disappointment. Overall we were fairly disappointed with our respective meals, as we didn’t feel that a single dish was good and it seemed as though the majority of their dishes were under seasoned. I know many consider Continental Treat an institution in Edmonton, but it’s going on my list of places that are sadly overhyped in this city. Sadly, I must disagree with this post. I eat at Continental Treat almost weekly because of the diversity of flavors. Some connoisseurs who rave about Bistro Praha's veal cutlets and schnitzel say that this is the one place in the city that can give them a run for their money. From their Paprika Chicken to their Hungarian Goulash, they remain true to the strong flavors of eastern Europe. Despite this review Continental Treat remains in the top 3 restaurants in the city I will treat my palate to. And I totally respect that many enjoy this place! It just didn't sing to my palette, though many I know who are Polish or Czech say it tastes very much like what their mother's used to make them at home, and it's very nostalgic food for them, so they go there to get a taste of home. Good for you for your honesty. I've eaten there a couple of times and have had reasonable experiences. It definitely sounds like yours sucked. Well I know've been there a few times and I think it's just what you grow up with. My Czech friend said it tasted like what her mom usually cooks, so obviously if you're used to this type of food or reminds you of childhood/home, then it's going to taste a heck of a lot better than if you're not used to it. Hi Unknown - I'd be more inclined to give it another try if you would be willing to identify yourself so I know you're just a regular/passionate customer and not the restaurant owner trying to convince me otherwise. I'm Foodie Rocks and I'm not the owner. If you call ahead of time, ask for the lamb tenderloins as it is not on the menu. The reason I recommend the lamb tenderloins, was that I had ordered lamb chops and instead got this instead. I was intrigued by the jalepeno shaped objects on the plate and took a bite. It was delicious! Thanks for the tip. Maybe I will go back with my friend Liv at some point and ask about the lamb tenderloins. been there dozens of times, and yes, I'm czech, and yes It's very good indeed. You seem to disagree with my thoughts on many places you've reviewed, so maybe I just like food that's well prepared and doesn't need a ton of seasoning that covers up the actual flavour of what I'm eating! Thanks for this comment. 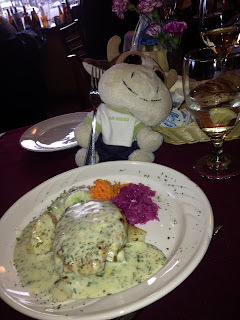 I am not very familiar with Czech food, however, I was in Prague for a week this past fall and found many tasty Czech treats. So perhaps I just don't prefer the way it's preferred at Continental Treat. I appreciate you reading my blog, however, please do not insult me by saying that I do not like "food that's well prepared and doesn't need a ton of season that covers up the actual flavor". Although I appreciate differing opinions, I also appreciate that everyone has different tastes. Our tastes obviously differ, however, that doesn't mean you have the right to insult me like this. In fact, I do enjoy well prepared food, and I actually prefer food that is not seasoned heavily, you can refer to my posts on Chapter One (Dublin) as an example of a restaurant I did not enjoy because they used a lot of sauce to cover up the taste of food. I generally prefer very simple dishes, with very few components. Unfortunately in the case of Continental Treat, the food was not well prepared, often with too much sauce or over cooked. Perhaps they were having an off night, but that was the experience that I had on that particular evening and sometimes you only get that one chance to impress. Had I been a tourist in Edmonton and that was the meal I had had, I would not return to this restaurant on future visits to the city because you obviously have limited time and limited funds. Although I live in Edmonton, I have many other restaurants to visit and limited funds and time, so I'm not likely to revist a restaurant any time soon that served me a meal that I disliked this much. Thanks for your thoughts, and if you don't agree with my posts, tastes, and wish to continue attacking me, please feel free to stop reading my blog. No one is forcing you to read it. Honestly, I've been to continental treat a couple of times and found it bland to terrible. The general feeling is that it is an institution with pomp and circumstance…and location, and that’s what keeps it open. The food is blah. And the famous pickle soup--ok, but nearly anyone can make that. Pyrohy are really bad for the price.